This Chicken Taco Dip with refried beans, shredded chicken, Shamrock Farms Zesty Jalapeño Sour Cream and cheese is the perfect addition to your Cinco de Mayo party menu. We don’t typically “celebrate” it, yet have on occasion ended up at our favorite Mexican restaurant on that day. It’s one of our favorite cuisines to eat, but it certainly doesn’t need to be the 5th of May for us to enjoy it. 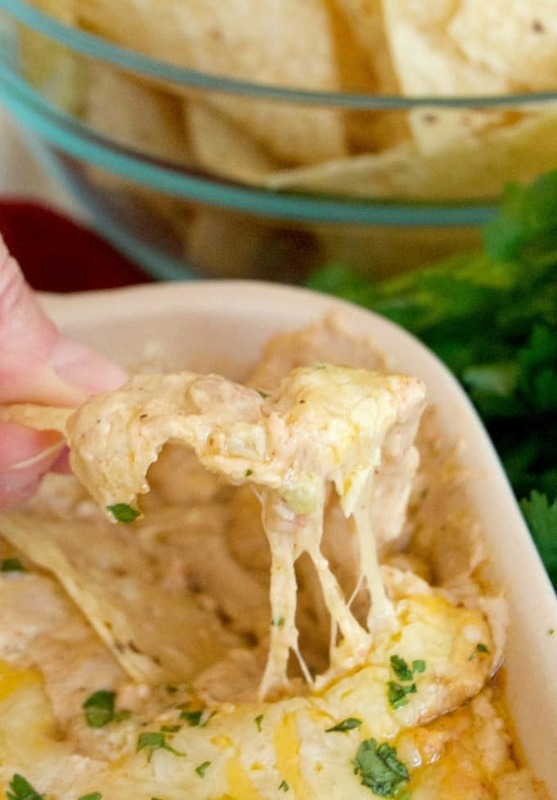 Like this Chicken Taco Dip. I’ve been eating this since I made it like it’s going out of style. The family will be lucky if there’s any left. Guess I’ll just have to make it again…and again…. It’s super easy to put together and can be ready in less than a half an hour. I love the burst of flavor the Shamrock Farms Zesty Jalapeño Sour Cream added to it! I’m not one for spicy foods, so the combination of creamy and zing was perfect. 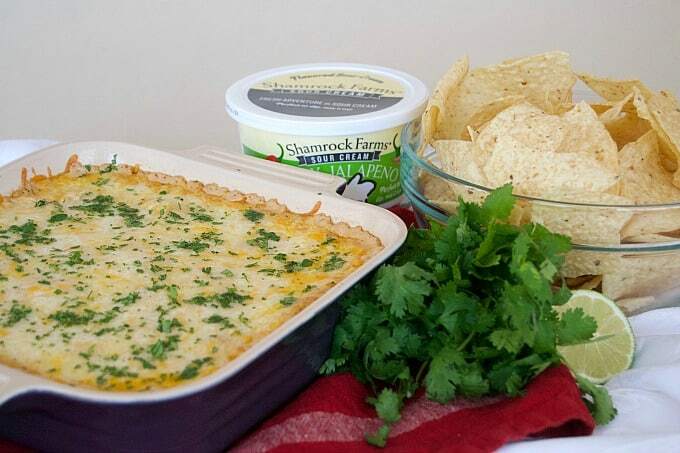 Shamrock Farms is a brand I’ve been using for years and this Lime Cheesecake Dip made with Shamrock Farms original sour cream will be a great addition to your Cinco de Mayo dessert table, too! I love to use and tell you about products that I love and trust and Shamrock Farms is just that. They start with the best milk, which makes their sour cream better than others. Don’t you want to use products made with milk that’s whole, pure and nutritious with no added growth hormones? I know I sure do! Their sour cream comes in a variety of flavors, too which makes it perfect in recipes for dipping, blending, or as a topping. 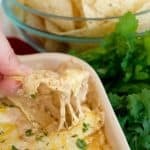 Use their plain, Creamy Ranch, French Onion, or Zesty Jalapeño as I did in this Chicken Taco Dip! These Baked Spicy Chicken Tacos will keep your party going. It will also be an easy dish to put out on the table. This Grilled Chicken Taco Salad will be a great alternative for those not interested in taco shells. I love that it’s so full of flavor and great ingredients! Dust off that slow cooker and make this Slow Cooker Chicken Taco Soup. It will be great to have on hand so that guests can help themselves. This Chicken Taco Dip with refried beans, chicken, Shamrock Farms Zesty Jalapeño Sour Cream and cheese is a perfect addition to your Cinco de Mayo menu. Preheat oven to 375 degrees F. and prepare a casserole dish, pie plate or 8 X 8-inch baking dish by spraying it with cooking spray. In a medium skillet over medium-low heat, combine the refried beans and cream cheese squares. Heat until smooth and completely blended. Mix in taco seasoning and shredded chicken and mix thoroughly. Remove from heat and add 1 cup of the shredded Mexican cheese and the Shamrock Farms Zesty Jalapeño Sour Cream, mixing well. Pour into prepared baking dish and evenly distribute the remaining cheese over the top. Bake for 15 - 20 minutes or until bubbly with cheese slightly browned. Squeeze the lime juice over the entire dish and sprinkle with chopped cilantro. Be sure to add these other Mexican recipes to your Cinco de Mayo menu, too! Everyone will love these Chicken Enchilada Bites. They’re bite-size, yet full of flavor! These Slow Cooker Carne Asada Taco Boats are great because the meat can be prepared ahead so you won’t have to worry about time constraints. For dessert, make this Banana Tres Leches Cake. SO moist and delicious, it will be the perfect dessert to close out your party!